Over 90% of the timber used to manufacture Soleta zeroEnergy houses is glued laminated timber. Glued laminated timber beams are more stable over time, there being no danger anymore of deformation and cracks normal to hardwood. In addition, they are more durable and environmentally friendly. Why? Glued laminated timber (Glulam) is also called laminated timber or multi-layered timber, is obtained by bonding together two or more softwood lamellas in well determined temperature and pressure conditions. The special adhesives used for bonding lamellas are structurally stable and resistant to moisture. Lamellas, in their turn, are obtained by successively lengthwise combining through a milling joint system, some selected pieces of timber of various lengths, thus obtaining lamellas with a homogeneous structure and coloration which will be processed on contact sides before gluing and pressing in the package. The laminated structural elements thus obtained are used in construction, especially in the manufacture of roofs, timber houses and industrial buildings but we frequently meet this special material used also for constructions such as bridges and high-tension poles. 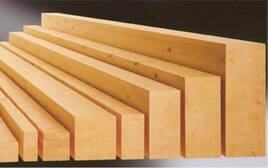 A special feature of the laminated timber is the possibility to obtain curved, arched elements. 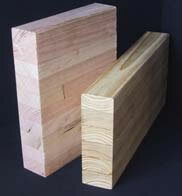 For its manufacturing, usually softwood is used, but other types of timber may be used, too. The interconnection of laminated timber structural elements is usually done through special metal connectors and bolts. Thanks to this technology, Glulam beams are more stable over time, there being no danger anymore of deformation and cracks normal to hardwood. Why does the use of laminated timber have a low negative impact on the environment? For the manufacture of laminated timber are used primary elements with small sections, which can be easily obtained from trees grown in plantations without having to cut down virgin forests. And losses are greatly diminished by this manufacturing process compared with the traditional method of manufacturing beams with large sections of hardwood. Thus is reduced the total amount of timber used, resulting in a lower impact on the environment. Avery important ecological aspect is to reduce the energy needed to manufacture laminated timber comparing with the one needed to manufacture elements with a similar role, made of concrete or metal. So, comparing elements with similar structural role, laminated timber is two thirds lighter than metal and six times lighter than concrete, and the energy needed to produce it is seven times lower than for the metal. Tensile strength of laminated timber elements is twice compared to that of metal and the compressive strength is twice better than that of the concrete. It is a material with high elasticity, out of which very long structural elements can be made (beams, arches) whose size is practically limited only by transport and handling conditions.